It’s BACK! After a break in 2013, the International Barbican Jazz & Blues Festival returns in 2014. This section will include details of each years Blues & Jazz Festivals, a sort of rolling history of this big event. I highly recommend people visit the festival an action packed week of music and events for everyone to enjoy. A huge free music event for the public to enjoy bringing you some of the best names in Jazz and Blues, from local groups to international. It’s back! Plymouth Barbican International Jazz and Blues Festival Returns for 2014. American musicians will be playing close to the Mayflower Steps at the Barbican International Jazz & Blues Festival 2014. Mississippi blues guitar-man Robin Henkel will headline the event, which takes place from June 13-15 on The Barbican, close to where the Pilgrims left for the New World in 1620. The Festival’s music programme is due to run between midday and 9pm on Friday and Saturday, midday to 7pm on the Sunday on an outdoor stage entertaining onlookers with excellent – and free – music. Robin Henkel will be joined by Ric Lee, award-winning drummer and descendant of Robert E. Lee, the head of the Confederate Army in the American Civil War. The pair will appear on Friday night at the Festival, performing vintage blues in front of the crowds at this free outdoor event. 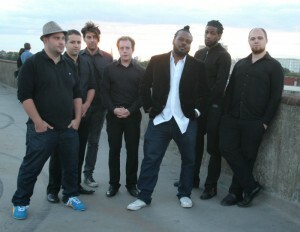 They will be joined by South West-based soul-blues singer Mama Tokus. “It’s great that we have got some Americans flying into play our event,” said Dan Thompson, Festival Director. 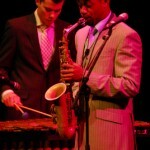 “We’re showcasing two great American artforms: blues and jazz. It’s perfect that we’re welcoming musicians from across The Pond”. King, Dizzie Gillespie, Bonnie Raitt, Dr John and John Mayall. Ric Lee has performed at the Festival before. In 2012 his band The Bayou Brothers stole the show when they whipped up the crowds with their infectious zydeco-blues – a Louisiana version of the blues, performed with accordion and rub-board. 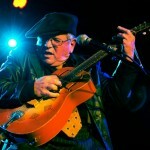 The Bayou Brothers won San Diego’s Best Blues Band award last year. After meeting Ric at the Festival in 2012, Mama Tokus was invited to perform in California in May 2013 with Ric and Robin. Now the musical exchange continues as the guys fly this way across the Atlantic. Robin and Ric join a series of headline acts that will excite audiences hungry for good music. As well as Robin Henkel, Friday night sees a performance by Dom Pipkin and the Iko’s – a riproaring New Orleans piano outfit. The band brings the classic sound of New Orleans funk and R’n’B right into the 21st century, led by killer piano man Dom, who has appeared with Dr John, Zigaboo Modeliste (drummer with classic funkers The Meters), Eric Bibb, Pee Wee Ellis, Ray Davies and Paul Jones. On early Saturday night we get Rabbit Foot – a raucous punk-rock-African blues two-piece from Brighton with guitar and tom-tom drums. This outfit was nominated for a British Blues Award last year and were London finalists in Hard Rock Café’s Battle of the Bands. They are followed by Brassroots – a 7-piece East London-based brass-band and percussion outfit, fusing an eclectic collection of musical genres played by a group of international musicians with groove, energy and an incredible funkiness. Brassroots have set stages ablaze from Ronnie Scott’s to Glastonbury, London Jazz Festival to Channel 4, Secret Garden Party and Bestival to WOMAD UK & Canarias, where 40,000 people on the streets of Las Palmas went nuts to their sound. The Festival is also showcasing top local musicians in its programming. Opening the Festival is Singapore-born, Torpoint-resident guitar man Jimmy Appudurai-Chai – a blues guitar artist whose claim to fame was knocking the Beatles off the Number 1 spot in his home country in 1969. You’ll see The Diehards – led by Plymouth slide blues supremo Thomas Ford, and infectious jump-jive boogie-woogie outfit The Roosters. The Co-operative Big Band opens proceedings on Saturday lunchtime, playing a set of funk and fusion, then you’ll hear The Blow-Up, perfoming versions of soundtracks and cinematic jazz. On Saturday night there will be a premiere of brand-new rhythm’n’blues outfit The Primitive Noise Band, fronted by superb songstress Becky Brine. On Sunday, listen out for trad-jazz trombonist Roger Marks and his Armada Jazz Band and swing big-band The Solar System, fronted by Rat Pack-inspired Michael Campari. 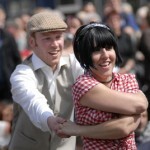 The Festival is brought to a close by Company B, performing swing, jump-jive and wartime inspired rhythm’n’blues. Business and venues are catching Festival fever by staging gigs and related events. There will be a stage outside Bacaro on The Parade, where blues and jazz music will be programmed throughout the weekend. There will be music in the arcade close to Parade Antiques, off Southside Street, with slide guitar man Thomas Ford there on Sunday June 15 from 1pm. On Wednesday June 11, Plymouth restaurant Bistro One, on Ebrington Street, is staging a Louisiana Supper, with Robin Henkel, Ric Lee and Mama Tokus, where diners can experience Robin’s music and talk close-up, whilst eating a Southern US-inspired menu. 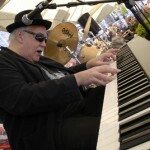 On Thursday night, the Plymouth Blues Society stages its first birthday party, in association with the Festival, where Vince Lee and the cream of Plymouth’s blues players will perform alongside Robin Henkel and Ric Lee. And Sutton Harbour-based eatery the Dolphin Brazzerie will be staging themed meals. The Admiral MacBride pub, close to the Mayflower Steps will also be hosting performances, as will Café Kiss on Bretonside. Kaos Production Ltd, creators and producers of the event, and Plymouth Waterfront Partnership (PWP), the Waterfront Business Improvement District, have teamed up to stage this year’s event. 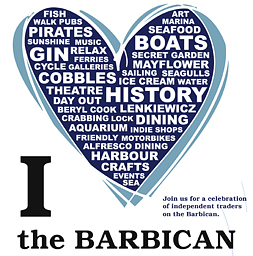 Unfortunately there is no Jazz & Blues Festival for 2013, however plans are being made to bring this large event back to the Barbican in 2014. 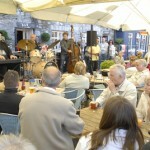 Plymouth International Blues & Jazz Festival 2012 – 27th to 29th July 2012. Latest News: There would be a free stage at the West Pier and also two cruises – a Blues Cruise on a Saturday evening and a Jazz Cruise on Sunday afternoon. There would be no street parade this year, but there would be bands around the quayside and there are plans for a Jazz band who will be marching down from the City Centre. *Buy your ticket to the Blues Cruise and you get £5 off entry to Son of Dave! What a deal! This year’s Festival complements Plymouth Classic Boat Rally and the Port of Plymouth Regatta and will create a host of quayside entertainment whilst picturesque boats moor up alongside, making a waterside bonanza of classic boats, dinghy sailing, yacht races and great music. The Festival is staged by Kaos Production Ltd and supported by Plymouth City Council and (this year for the first time) Plymouth Waterfront Partnership. 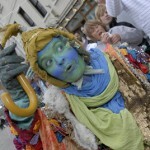 The Festival has shifted from its position on the first Bank Holiday of May, where it’s been since it started in 2008. It has also changed format. This year, look out for free music on West Pier, beneath the Prawn on the Barbi, and music on the water as well as on land, including on a floating stage! Visitors to this year’s Barbican International Jazz and Blues Festival can enjoy browsing and bargain-hunting to a blues and jazz soundtrack. This year’s brand new Festival Village incorporates an increased Festival Market, with quirky and captivating stalls selling arts, crafts, furnishings, fashion, food and lifestyle goods. There will also be a Festival merchandising stand, selling the music of the artistes featured in the event. 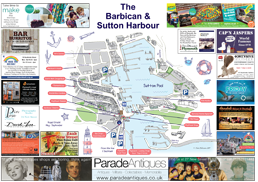 The Festival expanded last year with a market and was so successful that more stallholders are being added to make an exciting Festival Village, down on Commercial Wharf, The Barbican – right by the landing stage for the Mount Batten water taxi. There will be a network of waterside venues linking together to create a buzzy atmosphere of free and ticketed gigs. Look out for gigs in the B-Bar, the Barbican Theatre, Plymouth Gin Distillery, the National Marine Aquarium, the Blues Bar and Grill, The Treasury, the Admiral MacBride, The Minerva and more. “We had such a good response to the stalls last year that we decided to grow the Festival Market,” said Festival Director Dan Thompson. “It creates a real buzz for the Festival and gives festival-goers plenty to explore when they’re not watching live music. The Festival Village is a brand new addition to the Barbican International Jazz and Blues Festival and extends the event with a dedicated live music, licensed marquee which will be erected on Commercial Wharf. The marquee will be the Festival’s main outdoor stage, with a rolling programme of excellent live local, national and international acts. Entry to the marquee will be via new Festival Stroller Tickets, which are on sale from the Festival website and will be available for sale from the Barbican Tourist Information Centre in the run-up to the event, which goes from Friday April 29 to Monday May 2. (2) Half-Day Stroller tickets, for £10 each, giving access to the Festival Marquee daily either from 11am to 7pm, or from 7pm until 11pm. There will also be a limited number of tickets for each marquee gig, priced at £6, on sale at the marquee entrance just before each gig. 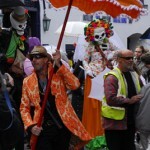 Stroller tickets will be available for sale from the Barbican Tourist Information Centre in the run-up to the Festival. The fourth annual Barbican International Jazz and Blues Festival is supported by Plymouth City Council and backed by the Plymouth Waterfront Partnership and brings excellent music and a groovy atmosphere to the city’s historic quayside quarter. This year, the event takes place over the four days of the first May Bank Holiday weekend – including an extra Royal Wedding Bank Holiday too. There will be a network of waterside venues linking together to create a buzzy atmosphere of free and ticketed gigs. Look out for gigs in the B-Bar, the Barbican Theatre, Plymouth Gin Distillery, the National Marine Aquarium, the Blues Bar and Grill, the Admiral MacBride and The Glassblowing House. The Festival brings together local and international acts from across the spectrum of jazz and blues. Headliners this year include piano man T J Johnson, keyboard crooner Joe Stilgoe, sax-funkers Porkchop and US guitar bluesman Michael Roach. Local band highlights include Becca Langsford launching her new album, blues player Vince Lee, slide guitar man Thomas Ford and his band the Dirty Harmonies, gospel soul-singer Mama Tokus and jazz diva Louise Parker. Swing Sunday pays homage to that section of jazz known as swing, which continues to appear in today’s charts – think Michael Bublé, Robbie Williams, Jamie Cullum – and we devote Sunday May 1 to this infectious genre. 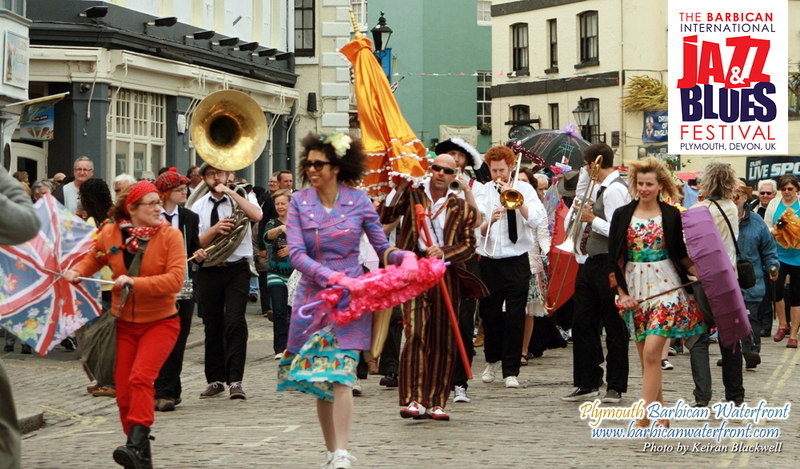 Watch out for swing bands, swing dancing in the street, colourful costumes and singalong tunes. We’ve teamed up with Plymouth swing dance teaching outfit Mad About Swing to bring workshops and dance action to the Festival. Swing bands and performers are being programmed throughout the day to ensure that everyone’s a King of the Swingers by the time Swing Sunday’s over. 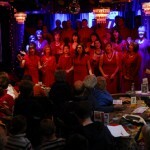 The Festival incorporates the Bank Holiday Monday May 2. 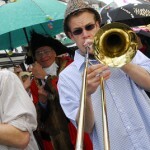 So organisers will be pulling out the stops to put on a fantastic day of music, street entertainment and the glorious Grand Festival Jazz Parade – complete with jazz umbrella waving.